It is time the small miners of California to once again tell our elected politicians to get off their butts and follow the laws they passed. We have penned a letter to the Senate Natural Resource Committee about the California Water Board having their staff cut literally days before they were to go public with permitting suction dredging in the state. The Water Board is now saying they don’t have the staff to complete the proposal. Politics? Ummm, duh. 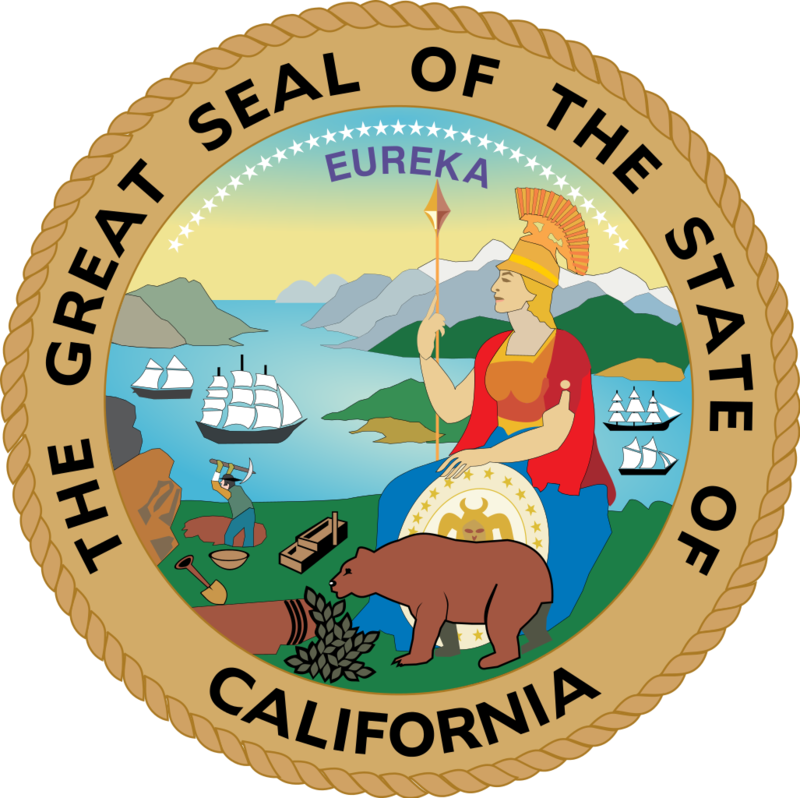 Note the miner on the seal of California……..
Take a minute and send them a letter, make a call or simply send them an email. We need to overwhelm them with comments about this travesty. Make a call, write a letter or send an email. Don’t sit and complain, react. I am writing today about SB637 (the suction dredge bill) which was passed in October of 2015 (Allen). SB637 mandated the California Water Board to evaluate small scale suction dredge activities and make their recommendations to either permit, or not to permit the activity in the state. After approximately a year of public meetings and extensive studies the CAWB made the determination to permit the deminimis activity and had planned to release their “draft proposal” to the public this month. As of last week, the CAWB told this writer they had their staff cut from 6 staff members working on the public release to just 2 right before they were to go public. I was informed now they do not have the staffing to complete the mandate in SB637. This process has now taken 3 years and if you review the previous legislative action on suction dredging in the state, the prohibition on suction dredging has been in place since 2009. This is not just unreasonable, but frustrates both State and Federal laws. 10 years of being shut down is not just a review of policy, science and activity, it is a clear and intentional prohibition and exposes the state to significant legal challenges. The problematic language in SB637, as presented during Senate testimony of SB1222 last January was so vague and ambiguous, every day items in one’s garage could be considered a suction dredge and therefore subject to fining and confiscation. Items the Senators likely have in their own garages. SB1222 was presented last January by Senator Stone to clarify the vague language in SB637 which incorrectly labels all motorized small scale mining as a suction dredge (this bill was shelved). A generator used in the desert near a dry wash to run lights is a suction dredge. A track wheelchair used to transport a wounded warrior to the river could be deemed a suction dredge. We even have one over-zealous Department of Fish and Wildlife Law Enforcement Officer (LEO) who told a miner his truck could be considered a suction dredge because it aids the miner by carrying his equipment to his mining claim and could be subject to confiscation. Obviously a generator is not a small scale suction dredge any more than a truck is. The permitting proposal the CAWB is releasing provides the relief of this ambigous language as a part of SB637. There are over 100,000 small scale miners in California and after 10 years, they should be allowed to see, hear and participate in the public release and comment period of this draft proposal by the CAWB. Not only is this prohibition affecting the economy of CA, devastating the rural communities it is impacting the lives of tens of thousands of miners who rely on small scale mining to supplement their incomes with gold recovered by the processes CAWB now says should be permitted. We have been in continual communication with the CAWB every step of this process and it is rather disconcerting that literally days before the release of this proposal they had their staff reduced by 66%. I, along with tens of thousands of small scale miners strongly urge you to investigate and require the CAWB to release this draft proposal as a part of SB637 and its mandate to do so in a timely manner.